Rising Costs, Policy Changes, and Higher Ed: Where Do We Go from Here? You are here: American University Communications & Marketing News Rising Costs, Policy Changes, and Higher Ed: Where Do We Go from Here? As the number of Americans enrolling in colleges and universities continues to rise, issues affecting higher education have been hot topics for public discussion. The cost of a degree, the role of government in higher education—these are just a some of the major issues institutions of higher education face. 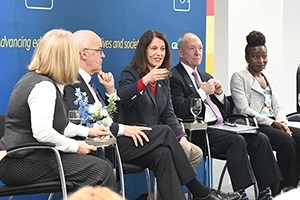 On March 9, American University hosted an event sponsored by the Council for Advancement and Support of Education (CASE) entitled " Claiming Our Story: The Imperative for Higher Education," to discuss how to address these concerns, as well as ways to help the public recognize the value of higher education. The panel discussion, moderated by CASE president and CEO Sue Cunningham, featured AU president Sylvia Burwell; Andrew Hamilton, president of New York University; Danielle Douglas-Gabriel, an education finance reporter for the Washington Post; and Ted Mitchell, president of the American Council on Education (ACE). Burwell kicked off the conversation by outlining four categories of concerns she has heard in discussions with students, faculty, staff, and alumni around the country: 1) value proposition—"what we cost, and what we're offering in terms of what it means to have a degree"; 2) issues around the future of work, from the role of artificial intelligence to what it means that people will change jobs 15 times throughout their careers; 3) the future of learning and lifelong learning; and 4) diversity, inclusion, and freedom of expression on college campuses. Responding to the first point, Douglas-Gabriel noted that due to the monetary investment required to obtain a degree, there is a perception that it must "translate into a job that pays as much, as quickly as possible, without recognizing the importance of education." Mitchell added that "the image is, you go to college to learn stuff, to get a job. Around that, citizenship, a sense of curiosity and self-purpose is really absent." So how do universities reconcile goals of fostering active, engaged, citizens of the world while also preparing students for the reality of finding employment after graduation? College, at its best, marries the two, Douglas-Gabriel said, while Burwell underlined the importance of empathy in answering tough questions about cost, especially when it comes to student debt and making college more accessible. "What does that feel like? Sitting in those seats, hearing and understanding becomes, 'OK, does this cost too much?'" she said. "This is why I'm so interested in understanding what does it really cost and why? Is the problem that it costs too much, or is the problem who is paying for it?" The conversation turned to the effect of recent policy changes in the higher education sector. Legislation like the tax bill, passed last December, and the PROSPER Act to reauthorize the Higher Education Act have serious implications for students, particularly related to costs. "Pushing the political buttons to be sure that we explain why higher education and continued strengthening, and even expanding of, higher education is critical for society," Hamilton said. Drawing upon Burwell's experience as Secretary of the US Department of Health and Human Services, Cunningham posed the question of whether the relationship between government and higher education, which are "obviously intertwined in complex ways," is working. "Probably both sides would say not as much as it should. Why is that?" Burwell said. "Part of what creates a relationship is trust, and I don't know that that exists at the level that it should." Burwell suggested that one way to build trust is to "find places where common ground exists," start from there and then work toward the harder, more contentious issues. "Can we all agree that what we want in higher education is affordability, access, and quality?" she asked. "Once you have agreement on the goal, then you drive the conversation to the substantive things that will get you there." As the event continued, discussion of financial issues turned to questions around the roles of philanthropy and endowments in funding colleges and universities. "The private sector does have an important role, but it is also important that as a society, state and federal policy support universities in a meaningful way," Douglas-Gabriel said. "Sometimes I do wonder if we rely too much on private dollars to the exclusion of state and federal support. That kind of allows them to not really care too much, because you can always have endowments." To close out the event, Cunningham asked each panelist to discuss how higher education changed their lives. Burwell shared that as a second-generation American, education was "the key to everything," and why her family came to this country. "The idea that you can take those tools that you learn—the critical thinking, the exposure to so many different points of view—the confidence it builds to do those scary things, and then get the opportunity to serve at the highest levels of your country, and in some of the largest organizations in the world, and then be able to come full circle and be back at an institution to contribute," Burwell said. "That's what education can do."